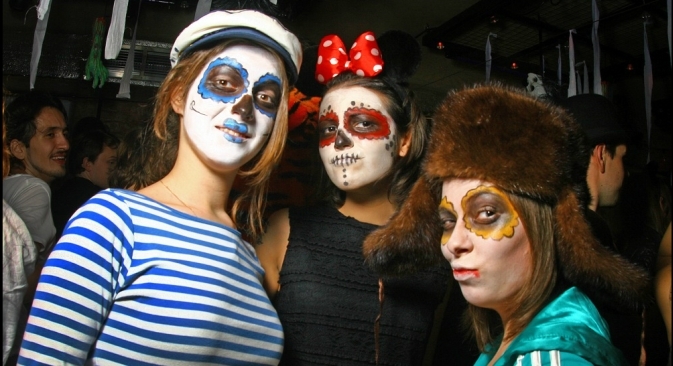 Ever popular in the U.S., Halloween remains a rather exotic and ambiguous holiday in Russia. The country’s youth are happy to take on the trappings of All Saints’ Day, but, for the Orthodox Church, even this is too much. According to sociologists at the Levada Center, Russians know about Halloween, but are not yet ready to celebrate it en masse. In Russia, four out of five people are aware that Oct. 31 is the date of “horrible” Halloween, on the eve of All Saints’ Day. Only one in twenty Russians, however, plans to observe this holiday. Traditionally, it is extremely popular with American youth. Daria, a student at Moscow State University, is one of the few in Russia who have adopted this Anglo-Saxon festival as their own. Foreigners in Russia react to Russian Halloween with skepticism, noting the superficial attitude toward the traditions of All Saints’ Day. “In Russia, it’s only a holiday for young people who do not respect the traditions; it’s just an excuse to wear a costume,” said Ashley, a native of Canada who has been living in Moscow for several years. However, this approach more than agrees with owners of costume stores and entertainment venues. “It is the most fun and colorful show of the year. On Halloween night, we are always sold out and there’s always a positive atmosphere. Only New Year can compete,” said Alexander, an administrator at a Moscow night club. As the day approaches, the excitement gathers momentum – particularly for the festive costumes. Most of the accessories for Halloween are bought at the last minute. “Every year, people go straight from the shop to a party in their new disguises,” said Tatiana, owner of a Moscow costume store that has been selling Halloween garb for six years. Year-after-year, the most popular costumes in late October have included zombies, Dracula, evil nurses, pirates, sailors, witches, devils, fairy-tale characters, vampires, and horror villains. “The creative half prefers ‘hand-made’ costumes, while in stores they only buy paraphernalia, like masks, horns, ears, wigs, eye-patches, sabers, swords, vampire teeth, and other accessories,” Tatiana said. “Behind all the masquerading of Halloween, of course, lies the loneliness of modern man in a secular world, his spiritual desolation, perhaps his search for a place to call his own, and even a certain degree of spiritual barbarism,” said Georgi Zavershinsky, priest and head of the communications service of the Department for External Church Relations. In this regard, the Russian Orthodox Church is not very interested in the experience and attitude of its Catholic and Protestant colleagues. “Even the Vatican’s attitude toward this holiday is, if not positive, at least neutral and calm. But Halloween in Russia provokes quite a negative response from the Orthodox Church,” said Ivar Maksutov, director of the Moscow Religious Studies Society. “According to our traditions, All Saints’ Day never acquired the form of a carnival. Carnivals are generally quite a rare phenomenon in Russian culture, and the reason is not entirely clear. So all this dressing up is essentially theatrical, and has no underlying cultural roots." "The Orthodox Church has always held a conservative attitude toward such phenomenon. Especially when the occasion is tinged with a certain confessional tone that seeks to emulate a religious environment, the negative reaction is quite understandable,” Maksutov added. Interestingly, some regional officials have gone a step further and tried to covertly ban Halloween, at least in schools. “Halloween contains religious elements – the cult, personification, and even mockery of death, evil spirits, etc. – that contradict the secular nature of education and can damage pupils’ mental and moral health,” the Ministry of Education of Karelia stated in a letter (leaked online) addressed to the heads of local authorities responsible for education. Fortunately for lovers of costume parties, the initiative soon fizzled out. Perhaps another reason why Russia’s young people are not entirely in step with the traditions of the festival is that not all of them dress up as dark forces or evil spirits. Vladimir, who owns a large online store of carnival costumes, notes that, in late October, people are happy to wear period costumes. This interest can be traced to the more traditional or historical dress found in other countries. “Vikings, Indian princesses, Bollywood stars, Josephine costumes, Pharaohs, Cleopatra, geishas, Native Americans, cowboys, and Greek warriors are at the top,” said Vladimir, describing his customers’ preferences. What Halloween costume have you chosen? RBTH invites you to impress your friends and be reincarnated as a Russian character from the Marvel Comics. Who are they and what do they look like? Find out with the interactive picture!